Be Informed & Take Action! The human community is an element of the Earth community, not the other way around. All human endeavors are situated within the dynamics of the biosphere. If we wish to have sustainable institutions and enterprises, they must fit well with the processes of the Earth. The ideology of industrialism, in both capitalist and communist countries, insists that modern society lives on top of nature and should rightly use and despoil the rest of the natural world as we desire – because any loss of the ecosystems is merely an "externality" in economic thought and because any problems can be addressed later by a technological fix. We are now living through the painful consequences of that arrogant, ignorant perspective. Many of our children suffer from accumulations of mercury and other toxins in their neurological systems, environmentally related cancer is on the rise, and our air and water are increasingly polluted. Meanwhile, our ecosystems are being compromised by the spreading presence of genetically engineered organisms. The health of the life-support systems – the ecosystems on our continent – is of paramount importance. Inherent in the efficient dynamics of those ecosystems is a vital profusion of biodiversity. Therefore, the Greens call for a halt to the destruction of habitats, which are being sacrificed to unqualified economic expansion. We humans have a moral responsibility to all of our relations, many of which are facing extinction because we carelessly and permanently halt their long evolutionary journey. Support a strong international climate treaty under the auspices of the United Nations Framework Convention on Climate Change. The United States must do far better than its offer in Copenhagen to reduce greenhouse gas emissions by 4% below 1990 levels. We should support at least a 40% reduction by 2020 and 95% reduction by 2050, over 1990 levels. a. Enact a Fee & Dividend system on fossil fuels to enable the free market to include the environmental costs of their extraction and use. These fees shall be applied as far upstream as possible, either when fuel passes from extraction to refining, distribution or consumption; or when it first enters the United States' jurisdiction. The carbon fee will initially be small, a dime per kilogram of carbon, to avoid creating a shock to the economy. The fee will be increased by 10% each year that global atmospheric carbon dioxide content is greater than 350 ppm, decreased 10% each year it's less than 300 ppm, and repealed entirely when it falls below 250 ppm. b. Although imported fossil fuel has no more impact on global climate change than domestic, importing petroleum and natural gas has a catastrophic impact on American foreign policy and the American economy. We will enact this same fee on imported fossil fuels a second time to give the free market an incentive to wean America off foreign oil and gas. c. The Green Party calls for elimination of subsidies for fossil fuels, nuclear power, biomass and waste incineration and biofuels. We must also acknowledge that the bulk of our military budget is, in fact, an indirect subsidy for oil & gas corporations. d. To prevent perverse incentives arising from higher carbon prices, the Green Party mandates clean fuels in addition to pricing carbon. Otherwise dirty energy sources like nuclear power, biomass and biofuels that are not subject to carbon pricing will become economically competitive. a. Pay for adaptation to climate change in countries with less responsibility for climate change. b. Provide a carbon neutral development path for those countries that can no longer be permitted to develop in the same way we did – by burning cheap fossil fuels. a. Adopt energy efficiency standards that reduce energy demand economy-wide by 50% over the next 20-30 years. The U.S. can make massive reductions in its energy use through a combination of conservation and efficiency measures. We don't actually need any additional power. Instead, we can and should reduce our consumption of power. b. Build an efficient, low cost public transportation system. The best incentive we can provide to live closer to work and reduce the use of private vehicles is to make the alternative inexpensive and convenient to use. c. Adopt a national zero waste policy. The less we consume and throw away, the less we will need to produce and replace. a. Create an inclusive program to train workers for the new, clean energy economy. Focusing on both the environment and social justice, prioritize the creation of green jobs in communities of color and low-income communities. b. Adopt a clean energy portfolio standard that rapidly replaces our combustion-based power sources with wind, solar, ocean, small-scale hydro, and geothermal power. c. End the use of nuclear power. Nuclear energy is massively polluting, dangerous, financially risky, expensive and slow to implement. Our money is better spent on wind, solar, geothermal, conservation and small-scale hydroelectric. d. Stop "dirty clean energy." Many of the "solutions" offered in climate legislation aren't real solutions. Biomass incineration (trees, crops, construction debris and certain types of waste), landfill gas and many types of biofuels will dump massive quantities of toxic pollutants into the air and water, and some of these energy sources produce more greenhouse gas emissions than coal. Natural gas is primarily methane, which is 25 times more potent than carbon dioxide as a greenhouse gas. Consequently, when pipeline leakage is considered, the clean-burning characteristics of natural gas can be lost, resulting in a fuel with climate impacts as bad as coal. Biomass and biofuels will also increase deforestation, contributing to more carbon dioxide in the atmosphere. a. Convert U.S farm and ranchland to organic practices. Chemical and industrial agriculture produces 35-50% of climate destabilizing greenhouse gases. b. Switch to local food production and distribution. Localized, organic food production and distribution reduce fossil fuel usage and enriches soil that sequesters more carbon dioxide. c. Reduce methane, nitrous oxide and other greenhouse gases by rapidly phasing out confined animal feeding operations, and encouraging a reduction in meat consumption. a. The U.S. must retrofit its building stock for energy efficiency. Most U.S. residents live in homes that require heat during the winter, and most are inadequately insulated. Buildings in the South require air conditioning during the summer. Fuel shortages, power outages, and energy price hikes could bring not just discomfort, but a massive increase in mortality from cold and heat. Millions of buildings can and must be super-insulated and, as much as possible, provided with alternative heat sources (passive solar, geothermal, or district heating). b. Energy efficiency standards similar to those in California must be adopted nationally. The energy efficiency standards adopted there in the late 1970s have resulted in overall electricity-use remaining flat over the past three decades while the population has steadily increased. During the same time period electricity use in the rest of the U.S. has climbed along with population growth. c. There are many different ways to increase energy efficiency and the best path for one region of the country might differ from that of another. We will need concerted effort to increase efficiency in every sector of our economy. Technologies exist that, if widely implemented, can result in huge energy savings. d. Cogeneration and use of waste heat to generate electricity should be encouraged. e. A carbon tax, which the Green Party supports, would serve as an important market incentive to increase efficiency. a. Many other solutions being pushed, including nuclear power, coal, industrial-scale biofuels, and low-grade fossil fuels such as oil shale and tar sands, create more problems than they solve. b. Further research with increased government support is needed into new energy storage technologies, as well as new cheaper and non-toxic photovoltaic materials and processes, and new geothermal and ocean power technologies. c. Policy tools to directly support the development of renewable energy sources, such as Renewable Portfolio Standards (RPS) and Feed-in Tariffs, should also be reviewed for effectiveness. In general, a feed-in tariff is legislation enacted by the government that requires the large electric utilities to guarantee a price for the renewably generated electricity fed into the grid. When done right, such as in Germany, this policy appears to succeed in harnessing entrepreneurial zeal. d. State-level financing policies like California's AB 811 can help homeowners install expensive renewable energy where the county pays the up-front cost and the system is paid for via the homeowner's property taxes. e. Greens support voluntary purchase of tradable renewable energy certificates; however, voluntary approaches are not sufficient. f. Greens support research into advanced fuels when the purpose of the research is to develop a fuel that in its full cycle does not create more problems than it solves. We support the use of hydrogen as an energy storage medium; however we oppose the use of nuclear technologies or carbon-based feedstocks for hydrogen production. g. We call for a ban on the construction of large-scale and inappropriately-located, hydroelectric dams. 3. Eliminate dirty and dangerous energy sources. c. We call for a ban on mountaintop removal coal mining. With limited supplies and in the absence of commercially viable "clean coal" carbon sequestration, which may never be feasible, coal is neither an economically nor an environmentally sustainable solution. f. Due to serious negative impacts on food, soil, and water, we oppose industrial-scale biofuels production and biomass burning for electric power generation. We approve small scale distributed production under local control, such as production of biodiesel from waste oils, production of charcoal and byproducts from wood wastes or sustainably harvested wood, small scale production of ethanol from crop wastes or maize stalk sugar, or production of fuel gas for localized electricity generation from anaerobic methane digesters or charcoal gasifiers. We do not object to the utilization of fuel gases seeping from landfills, as that is one way to reduce air pollution. We support as a minimum standard the Principles for Sustainable Biomass statement signed by Clean Water Action, Environmental Defense Fund, Environmental Working Group, Friends of the Earth, Geos Institute, Greenpeace USA, National Wildlife Federation, Natural Resources Defense Council, Southern Alliance for Clean Energy, Southern Environmental Law Center, Union of Concerned Scientists, The Wilderness Society, and World Wildlife Fund. g. Enact a moratorium on hydraulic fracturing ("fracking") until its damaging effects on water and air quality are fully studied and understood. Permanently ban high-volume hydraulic fracturing in sensitive watersheds. Regulate hydraulic fracturing under the Safe Drinking Water Act, Clean Water Act and National Environmental Policy Act, and require public disclosure of the chemicals used in fracturing fluids. a. We support "smart grid" upgrades. The federal government must step in to set goals and standards and to provide capital. This effort must not favor commercial utilities over municipal power districts. b. The Green Party supports net metering to make decentralized energy production economically viable. 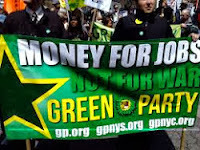 c. Greens support tax-exempt bonds to finance public ownership of utilities and to allow publicly owned utilities to finance conservation and renewable energy projects. d. We oppose deregulation of the energy industry. Our national industrial food system is overwhelmingly dependent upon oil and natural gas for farm-equipment fuel, fertilizer, pesticides, herbicides, and the transport. It is responsible for over 12% of all greenhouse gases from human activities in the U.S. New farming methods, new farmers, and a re-localization of production and distribution are needed. These will require land reform, an investment in revitalizing rural areas and the creation of local food processing plants and storage centers. Laws and incentives affecting the food system (including food safety laws and farm subsidies) will need to be rewritten to provide preferential support for small-scale, local, low-input producers. a. Investment: Enormous amounts of investment capital will be needed to accomplish the energy transition, much more than the promise of $150 billion for renewable energy over ten years, and must now come from government. b. Coordination: The energy transition will be complex and comprehensive, and its various strategies will be mutually impacting. For example, efforts to redirect transport away from highways and toward rail service will need to be coordinated with manufacturers, farmers, retailers, and employers. An independent federal Energy Transition Office should track and manage the transition. c. Education: Community colleges should prepare workers for new job opportunities, e.g., sustainable food production, renewable energy installation, grid rebuilding, rail expansion, public transport construction, and home energy retrofitting. Grade school curriculum should include gardening programs in all schools and increased emphasis on energy conservation. d. Public Messaging & Goal Setting: Our leaders must instill in the nation a sense of collective struggle and of a long journey toward a clear goal. The success of a project of this scope will require public buy-in at every stage and level, including the use of language and images to continually underscore what is at stake, to foster a spirit of cooperation and willing sacrifice. A series of challenging yet feasible targets should be set, with the ultimate goal – complete freedom from fossil fuel dependency – to be achieved by 2050. The federal government should take the lead by setting targets for federal facilities. Achievement of annual targets should be cause for public celebration. 1. The Green Party recognizes that there is no such thing as nuclear waste "disposal." All six of the "low-level" nuclear waste dumps in the United States have leaked. There are no technological quick fixes that can effectively isolate nuclear waste from the biosphere for the duration of its hazardous life. Therefore, it is essential that generation of additional nuclear wastes be stopped. 2. The Green Party calls for the early retirement of nuclear power reactors as soon as possible (in no more than five years), and for a phase-out of other technologies that use or produce nuclear waste. These technologies include non-commercial nuclear reactors, reprocessing facilities, nuclear waste incinerators, food irradiators, and all commercial and military uses of depleted uranium. 3. Current methods of underground storage are a danger to present and future generations. Any nuclear waste management strategy must be based on waste containers being stored aboveground and continuously monitored, and the containers must be retrievable and capable of being repackaged. All such strategies must also minimize the transportation of wastes. 4. The Green Party strongly opposes any shipment of high-level nuclear waste across the U.S. to the proposed Nevada waste repository at Yucca Mountain, or any other centralized facility. The Green Party believes that this proposal is part of a move to re-fire a fast-track, commercial nuclear industry by providing a means for "safe disposal." We deny there is such a thing as safe disposal of nuclear waste. 5. We call for cancellation of the Waste Isolation Pilot Plant (WIPP), the nation's first weapons complex nuclear dump in southern New Mexico. 6. We call for independent, public-access radiation monitoring at all nuclear facilities. 7. We support applicable environmental impact statements (EIS) and National Environmental Policy Act (NEPA) analysis with citizen participation at all nuclear sites. 8. We support an immediate and intensive campaign to educate the public about nuclear problems, including disposal, cleanup, and long-term dangers. 9. We oppose the export of nuclear technologies or their wastes to other nations. 10. We oppose public subsidies for nuclear power, including Price-Anderson insurance caps and stranded cost recovery bailouts. We oppose federal loan guarantees to enable the construction of a new generation of nuclear reactors. 11. We oppose the development and use of new nuclear reactors, plutonium (MOX) fuel, nuclear fuel reprocessing, nuclear fusion, uranium enrichment, and the manufacturing of new plutonium pits for a new generation of nuclear weapons. 12. We oppose the deregulation of radioactive materials and wastes, which is allowing such wastes to be recycled into consumer products and to enter municipal waste landfills and incinerators. We call for the strict regulation, tracking, monitoring, and recapturing of radioactive materials and wastes. 13. We call on the military to clean up depleted uranium contamination from testing ranges and battlefields and to fully compensate exposed veterans and civilians who have been affected by depleted uranium exposure in the U.S. and elsewhere. The Green Party supports a transportation policy that emphasizes the use of mass transit and alternatives to the automobile and truck for transport. We call for major public investment in mass transportation, so that such systems are cheap or free to the public and are safe, accessible, and easily understandable to first-time users. We need ecologically sound forms of transportation that minimize pollution and maximize efficiency. Surfaces impermeable to rainwater, polluted storm run-off; paved over or polluted wetlands, the heat island effect, air pollution, and acid rain are all directly related to a transportation system run amuck. a. Make streets, neighborhoods and commercial districts more pedestrian friendly. b. Increase the greenery of streets. c. Utilize traffic-calming methods, where the design of streets promotes safe speeds and safe interaction with pedestrians. Create auto-free zones. d. Develop extensive networks of bikeways, bicycle lanes and paths. Include bike racks on all public transit. e. Maintain free community bicycle fleets, and provide necessary support for cyclists. a. Redirect resources that currently go to enhancing auto capacity into expanding human-scale transit options. b. Develop affordable mass transit systems that are more economical to use than private vehicles. c. Encourage employer subsidies of transit commuter tickets for employees, funded by government Congestion Management grants. d. Use existing auto infrastructure for transit expansion where possible. Light rail could be established in expressway medians through metropolitan high-density corridors. e. Include land use decisions in transportation issues, with consideration of the need for mass transit to have a market and be viable, and with attention paid to cross-commuting—the practice of people commuting to a place where they could and should live. f. Expand our country's network of rail lines, including high-speed regional passenger service. g. Transfer ownership and operation of all intercity railroad trackage currently under control of freight railroads to responsible and adequately funded public agencies, as is done with highways, to provide for efficiency and safety of all rail traffic. a. Place a moratorium on highway widening, appropriating funds instead for mass transit and facilities for pedestrians and bicyclists. b. Mandate HOV (High Occupancy Vehicle) lanes on freeways, and lower tolls for carpools. c. Discourage unnecessary auto use by eliminating free parking in non-residential areas well served by mass transit, and establish preferential parking rates for HOV. d. Regularly increase Corporate Average Fuel Economy (CAFE) standards to levels which truly challenge automakers to improve the state of the art, using the fuel economy performance of vehicles worldwide for reference. Eliminate the distinction between cars and light trucks, the footprint loophole, the E85 loophole and the 8500-pound exemption. Eliminate the perverse incentives for alternative fuels that increase the nation's petroleum consumption. Enact a Fee & Dividend system on the carbon content of gasoline, Diesel fuel and E85. e. Enact a fuel-economy-based Federal sales tax that creates a significant incentive for people to select more-efficient vehicles, and for automakers to make them available in the United States. f. Lead by example, using government procurement to put more high-efficiency and alternative-fuel vehicles into service. h. Encourage carpooling programs, telecommuting, and other creative solutions to reduce commuter traffic congestion. i. Remove the most-polluting vehicles from the road by requiring every vehicle to comply with the emission standards in effect when it was manufactured before issuing or renewing its license. a. Make airports accessible by local transit systems. b. Legislate further incremental reductions in airplane noise and air pollution. c. Emphasize the use of light and heavy rail for freight transportation. 1. Phase out all avoidable production and sale of toxic metals, persistent organic pollutants, persistent bio-accumulative toxins, synthetic petrochemicals, and halogenated chemicals. Replace them with non-toxic alternatives. 2. Make manufacturers responsible for the full life cycle of their products by requiring them to take back used products and packaging for remanufacturing, reuse, or recycling. 3. Support and implement the precautionary principle: "When an activity raises threats of harm to human health or the environment, precautionary measures should be taken even if some cause and effect relationships are not fully established scientifically. In this context the proponent of an activity, rather than the public, should bear the burden of proof. The process of applying the precautionary principle must be open, informed and democratic and must include potentially affected parties. It must also involve an examination of the full range of alternatives, including no action." 4. Strengthen right-to-know laws so that everyone can discover what toxic or potentially toxic chemicals are used and released in their communities, and in products that they might purchase or use. 5. Hold corporations strictly liable for the consequences of the pollution they produce. We support the Citizens' Platform on Superfund, as adopted at the 1995 Communities At Risk Superfund Summit in Washington, DC. End the use of incineration as a cleanup technology, and ensure that "cleanups" don't simply relocate toxins to chemical waste dumps in poor communities of color. (c) Neutralization, sterilization or detoxification methods where applicable. 7. Do not deregulate wastes containing toxic or radioactive contaminants significantly above background levels. They should not be allowed to be used in "beneficial use" schemes as fertilizer, "co-products," or fuels; or by "recycling" them into consumer products (including construction materials) or disposing of them as municipal waste. 8. Do not export, under any circumstances, chemicals that are prohibited in the United States. We oppose shipping of toxic, hazardous, or radioactive wastes across national borders, and the shipment of such wastes without strict regulation across any political borders. Waste should not be considered a tradable commodity under the Interstate Commerce Clause. 9. Safe, secure, above ground storage for existing nuclear waste. We oppose exporting nuclear waste to other nations. 10. Strict regulation of radioactive materials and wastes and prohibiting such wastes to be recycled into consumer products and to enter municipal waste landfills and incinerators. 11. Close, clean up and remediate at national labs devoted to nuclear energy and weapons development and operations at the Department of Energy's nuclear production sites. 12. Clean up depleted uranium contamination from testing ranges and battlefields, and provide generously compensate veterans and civilians who have been sickened by depleted uranium exposure. 13. Require independent, transparent radiation monitoring at all nuclear facilities. 14. Substitute chemical safety testing on animals with alternatives that do not use animals, wherever such alternative tests or testing strategies are available. Earth's atmosphere is in great danger due to man-made chemicals and hydrocarbon emissions. Chlorofluorocarbons (CFCs), hydrochlorofluorocarbons (HCFCs), and other related ozone-depleting substances should be banned as soon as is possible. There is a fundamental difference between growth and development and between quantity and quality. Rather than exploiting the Earth for short-term gain, Greens believe in living in sustainable balance with it. Land use practices must be founded on stewardship of the Earth, to honor the interconnected and interdependent nature of all life, to respect ecosystems and other species, while at the same time providing for human needs in a responsible and sustainable way. 1. Insist that every property right has an implied responsibility to provide for the common good of people, places and the planet. 2. Encourage the formation and operation of cooperatives, non-profits, land trusts, co-housing, and other forms of communal and public interest management of land and resources. 3. Promote livable urban environments to minimize urban sprawl. Promote urban infill with affordable housing, mass transit, schools, jobs, health care, public spaces, bicycle and walking paths, community gardens, open spaces, parks, playgrounds, and urban growth boundaries. 4. Green our cities with green belts, energy-efficient infill, distributed solar and wind generation, gray water systems, under grounding of wires and pipelines, redevelopment of brown fields, closed loop, energy-producing sewage systems, watershed protection and urban agriculture. 5. Restore damaged urban ecosystems. 6. Consider the carrying capacities of the bioregions in which our cities are located and attempt to match urban populations to these natural limitations. 7. Support environmental justice policies that give communities a voice in planning future development with the goal of preventing concentration of polluting industries and practices in poor and/or minority communities. 8. Preserve and expand rural land use patterns that promote open space, healthy ecosystems, wildlife corridors and the ecologically sustainable agriculture. Protect and expand large continuous tracts of public and private land for wildlife habitat and biological diversity, to permit healthy, self-managing wildlife populations to exist in a natural state, and to promote complete ecosystems. 9. Promote livable rural communities to minimize urban migration. 10. Transition rural communities into sustainable relationships with ranching, agriculture, forestry and mining. 11. Reward farmers and ranchers for the ecosystem services they provide on private and public lands. Favor policies that promote mall-scale farmers and ranchers over large-scale corporate agriculture and ranching. 12. Repeal the General Mining Law of 1872. 13. Enact mining reforms to better balance mining with other important public land uses; provide a fair financial return to taxpayers for resources extracted, and create a fund for clean up of abandoned mines. Enact tough new environmental safeguards to protect against mining pollution, including strict curbs on mercury emissions from metal mines. 14. Eliminate public subsidies for livestock grazing on public lands. Raise grazing fees on public land to approximate fair market value. 15. Oppose the sale of any portion our national parks, forests or coastlines. Fund and maintain public lands in a healthy and productive state. Oppose commercial privatization of the management of these lands. 16. Ensure public ownership of natural resources located on public lands. Halt federal mineral, oil and gas, and resource giveaways, "royalty holidays," and flagrant concessions to the mining, energy and timber industries on public lands. 17. Restore and remediate damaged ecosystems on public lands. 18. Protect old growth forests, ban clear cutting and ban industrial timber harvest on public lands. Minimize road building on public lands. 19. Ban indiscriminate wildlife "damage control practices" and abolish Wildlife Services. 1. We need strong national and international laws to promote conservation, reclaim polluted water systems, develop water-supply restrictions, ban toxic and pesticide dumping, control or ban corporate farming, and bring the rule of law to transnational corporations that pollute water systems. Mining and depleting the present underground aquifers must be severely restricted. 2. Greens oppose the privatization of water and demand that the U.S. government pass strong laws with effective enforcement mechanisms to assure a safe and adequate supply of water for its citizens and all life within its borders. 3. New forms of international, bioregional, and community organizations, watershed/ecosystem-based, must be created to monitor and equitably distribute the fresh water necessary for all life on our planet. Decisions about water must be based on an ecosystems approach. a. Mandate water efficient appliances and fixtures be used in all new construction, and promote retrofitting of older buildings. b. Promote native landscaping and other drought resistant/ climate-appropriate plants, in order to reduce the need for irrigation. c. Promote drip irrigation systems where irrigation is necessary. d. Eliminate storm water pollution of our water resources through education of our citizens, enforcement of our laws, and holistic watershed management. Promote storm water technologies that detain, treat, filtrate, and use storm waters near where it is collected. e. Promote the appropriate reuse of the "gray" and "black" waters we produce. Use separation techniques, such as dual piping systems where pure water is used for drinking and washing, and reclaimed water is used for lawn watering and similar purposes. f. Mandate pre-treatment of industrial wastes to eliminate the presence of metals, solvents, and other toxins in sewer water. This would reduce the cost of municipal treatment and encourage wastewater reuse. g. Promote passive and natural systems, such as wetlands, for water and wastewater treatment where appropriate. h. Eliminate water subsidies for corporate agribusiness. Higher water prices give agribusiness incentives to conserve. i. Assist community organizations to monitor the use of local resources, and to oversee the enforcement of water quality regulations. j. Preserve and restore the nation's natural water features (streams, rivers, lakes, bays, wetlands and groundwater aquifers) that are vital to achieving sustainable use of water resources. 5. Chemicals used in the fluoridation of America's public drinking water supplies are toxic waste byproducts. The majority of these toxic wastes come from the phosphate fertilizer industry. Fluoride accumulates in the human body through ingestion and inhalation. A growing body of research suggests that fluoride may be associated with arthritis, hip fractures, bone cancer, kidney damage, infertility, and brain disorders. 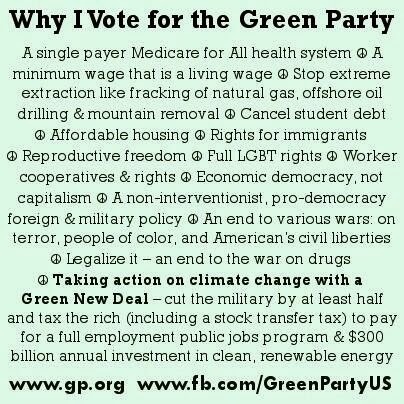 For these reasons, the Green Party opposes the fluoridation of drinking water. According to the 2006 United Nations' "Livestock's Long Shadow" report and the World Watch Institute's 2009 article "Livestock and Climate Change," the livestock sector is one of the most significant contributors to our most serious environmental problems, including global warming, land degradation, air and water pollution, and loss of biodiversity. 1. We encourage legislation that assists new farmers and ranchers, that promotes widespread ownership to small and medium-sized farms and ranches, and that revitalizes and repopulates rural communities and promotes sustainable development and stewardship. 2. We support new farming and growing opportunities and urge the inclusion of non-traditional crops and foods in farm programs. 3. We advocate regionalizing our food system and decentralizing agriculture lands, production, and distribution. We encourage public support for producer and consumer cooperatives, community kitchens, Community Supported Agriculture, urban agriculture, and community farms and gardens. 4. We advocate the creation of a Food Policy Council composed of farmers, including small farmers and consumers, to oversee the USDA and all food policies at the local, state, and national level. This council should adjudicate conflicts of interest that arise when industries police themselves. 5. We support the highest organic standards (California Organic Certification Standards, for example). We advocate shifting price supports and government subsidies to organic food products so that they will be competitive with chemically produced food. We believe that everyone, not just the wealthy, must be able to afford safe and healthy food. 6. We urge the banning of sewage sludge or hazardous wastes as fertilizer, and of irradiation and the use of genetic engineering in all food production. 7. We would phase-out man-made pesticides and artificial fertilizers. We support Integrated Pest Management techniques as an alternative to chemical-based agriculture. 8. Food prices ought to reflect the true cost of food, including the health effects of eating processed foods, antibiotic resistance, pesticide effects on growers and consumers, soil erosion, water pollution, pesticide drift, and air pollution. Indirect costs (loss of rural communities, a heavily subsidized transportation system, cost of the military necessary to defend cheap oil, and reduced security), though more difficult to calculate, should be factored into the cost of our highly centralized food system. 9. World hunger can best be addressed by food security – being self-sufficient for basic needs. Overpopulation is largely a consequence – not simply a cause – of poverty and environmental destruction, and all remedial actions must address living standards and food security through sustainable production. 10. Because of the tremendous amount of energy used in agriculture, we support farm subsidies to encourage the transition from dirty fuels to clean renewable energy as one of the most effective ways to move our country to a sustainable future. 11. We support legislation that provides energy and fuel conservation through rotational grazing, cover-crop rotations, nitrogen-fixing systems, and fuel-free, clean renewable energy development on the farm. 12. We encourage states to promote net-metering to make decentralized energy production economically viable. 13. Animal farming must be practiced in ethically and environmentally sustainable ways. We support a rapid phase out of confined animal feeding operations (CAFOs) not only because of their adverse impact on the environment, but also on food safety (e.g. disease epidemics), public health, and animal protection. 14. Applying the Precautionary Principle to genetically modified organisms (GMOs), we support a moratorium until safety can be demonstrated by independent (non-corporate funded), long-term tests for food safety, genetic drift, resistance, soil health, effects on non-target organisms, and cumulative interactions. Most importantly, we support the growing international demand to eliminate patent rights for genetic material, life forms, gene-splicing techniques, and biochemicals derived from them. This position is defined by the Treaty to Share the Genetic Commons, which is available through the Institute for Agriculture and Trade Policy. The implications of corporate takeover and the resulting monopolization of genetic intellectual property by the bioengineering industry are immense. 15. We support mandatory, full-disclosure food and fiber labeling. A consumer has the right to know the contents in their food and fiber, how they were produced, and where they come from. Labels should address the presence of GMOs, use of irradiation, pesticide application (in production, transport, storage, and retail), and the country of origin. 16. We support the restoration of farmlands to Black families who have been discriminated against and who have lost -- or are about to lose -- their farms as a result. Greens will work for a meaningful remedy to restore black farmers' unencumbered ownership of their land. 1. The Green Party supports a strengthened and enforceable Endangered Species Act. 2. The Convention on Biological Diversity, first adopted at the Earth Summit in 1992, is a primary statement of purpose regarding how we can act to preserve and sustain our common genetic resources. We protest the demands of the U.S. to amend this unprecedented international agreement on behalf of the biotechnology and pharmaceutical industries, with their insistence on protection of their intellectual property and technology transfer rights. emphasize traditional and heirloom seeds. 4. We call for widespread education on the critical importance of efforts being made to replant indigenous plant life where it has dwindled or been lost. 5. We oppose monopolistic production of high-tech hybrid seeds. This is the basis of monoculture where agribusiness relies on non-sustainable methods such as single crop varieties bred with industrial traits and grown with high input of energy, chemicals, and pesticides. This has led to a massive loss of biodiversity, displacing traditional varieties and seed stocks. 6. We encourage the use of diverse natural seed varieties passed down over many generations. Crops can be grown with the best plants' seeds being saved season to season. 7. We oppose international trade agreements (NAFTA, GATT and the WTO in particular) that have precedent-setting provisions protecting transnational, corporate control of the intellectual property of genetic material, hybrid seeds, and proprietary products. 8. We support reintroducing native species to areas from which they have been eradicated, eliminating predator control on public lands, and reintroducing native predators where they would contribute to a viable ecosystem. 9. We should educate ourselves about animal behaviors to overcome our culture's irrational fear of wildlife, and learn techniques of co-existence with other species. 10. Since the efforts to clone animals – and eventually humans – has been undertaken by profit-making corporations, the purpose behind such projects is to manufacture commodities. To classify a human (or any part thereof, including human DNA and body organs) as a commodity is to turn human beings into property. Vast forests once covered most land, moderating the Earth's climate and providing habitats for myriad species of wildlife. The Earth's remaining forests are a critical resource in that useful products, especially medicines, originate in the forest. Today's global market economy, in the hands of multi-national corporations, irresponsibly uses and often destroys this valuable and irreplaceable resource. The governments of many countries are selling off their rain forest land to cattle growers for the production of cheap beef, most of which is exported to first-world countries such as the U.S. Unsuitable rain forest land is also given to subsistence farmers who ruin the soil in a few seasons. In the meantime, landowners hoard prime agricultural land for speculation. On both state and federal lands, trees are harvested and the raw logs are exported, causing jobs to be exported. 1. Overhaul state and U.S. Forest Service rules to protect our forests and use them wisely. 2. Review, reform and restructure all federal and state land-use policies so that our practices become environmentally sustainable, and so that forests provide a continuing supply of high quality wood products. 3. Stop building logging roads in national forests at taxpayers' expense. These roads not only cost more than the revenue from timber sales that they expedite, but they also contribute to soil erosion and silting of streams, which ruin fish habitats. 4. Ban the harvest of Ancient Forests. 5. Ban the export of raw logs and other minimally processed forest products (pulp, chips, carts, slabs, etc. ), which causes American job loss. 6. Offer subsidies to local watershed-based mills. This will maximize employment opportunities through value-added processing, and promote sustainability and worker control. 7. Use work projects, goats, and other sustainable methods to control undergrowth rather than spraying herbicides, especially near communities. 8. Grow and use hemp as a plentiful and renewable resource for the manufacture of paper and other forest products. 9. Protect significant archaeological, historical and cultural sites. 10. Support the rights of people indigenous to the rain forest, and their ecologically sound use of the forest – such as rubber extraction, nut gathering, and collecting medicinal herbs. End the importation of rain forest beef. 11. Forgive the debts of Third World countries that need help in halting the destruction of their rain forest lands. 12. Develop labels that identify ecologically sound forest products. This would help consumers to support ecologically sound forestry. 13. Protect wildlife habitats, fisheries, biodiversity, scenery, and recreation. 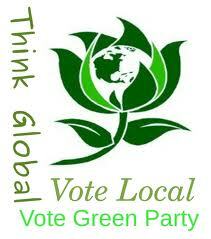 We must accept responsibility for the affect local actions have on the global economy and ecology. 1. Protect 40% of the world's oceans as marine preserves, especially near shore coastal habitats. Determine protected zones through a democratic process involving all stakeholders. 2. Ban offshore oil drilling. 3. Ban the siting of liquefied natural gas facilities off the U.S. coast. 4. Phase out use of the once-through cooling process, currently used by power plants, in and near coastal waters. 5. Require secondary treatment of waste effluent before release. 6. Ban ocean transportation of nuclear and toxic waste. 7. Ban sonar testing in the oceans. 8. Support the ban on international commercial whaling as well as other international efforts to protect endangered marine species. 9. Ban drift-net fishing and long-line fishing and phase out factory trawling. 10. Map undersea toxic dump sites, and investigate methods of rendering them harmless. 11. Ban the importation of fish and fish products caught by drift-nets and other illegal means. 12. Ban the importation of coral products and the destruction of breakwaters. 13. Support the Law of the Sea Treaty that establishes the global sharing of ocean resources. 14. Support complete cleanup of existing and past oil spills. Cost of cleanups and compensation for affected communities should be paid by the corporations responsible for the spills.